Night before last, a voice from the past left a phone message for me. She invited me to a Neighbor-to-Neighbor (n2n) gathering and it warmed my soul. In poking into the back of a big filing cabinet my husband was casting off, I discovered an n2n scrapbook two weeks ago that tugged at my heart's memories. With a six-month-old, I screwed up the courage [in retrospect, I know it wasn't just me] to host a neighborhood conversation on race relations after the 2001 Cincinnati riots. It seemed a simple thing that I could do, given I was pretty much tied to home with an infant and toddler. For three years I was committed and active in this diverse group: marching in parades, fostering media attention, attracting members and, finally, helping plan and emcee a local forum. Funny thing is, one of my daughter's was throwing up that night, my husband was out of town and I was out of luck. I missed the forum and, from there, life intervened and I pretty much left n2n behind. Yet this group persevered through some amazing and tenacious leadership and a dedicated membership to continue nine years later. Last night's potluck was special. I reconnected with some wonderful old friends and met new faces. I kept waiting for the meeting to commence, but the visiting never ceased ... at least not before I had to leave. It was simply a group of friends connecting over a meal. And then it struck me as the beauty of the entire effort. When I had been so busy recruiting, planning and organizing, all that was necessary was to show up with an open heart. Perhaps, however, the ease of last night's communion would not have happened without what came before. I learned so much in that group. As my friend Frank always said, overcoming racial tension "begins one heart at a time." I was dumbfounded to hear of the blatant and less-pronounced discrimination some of these new friends faced and still encounter. Curley said racism has not gotten better, "it's just gone underground." These are all local people, maybe not my immediate neighbors, by my neighbors nonetheless. In one of the early "programmed" n2n meetings, Jill and Kent presented a study on the Good Samaritan parable in which we probed the truth of that story in a way I had not before, exploring just who is my neighbor. It was riveting then and is so very deeply seeded within me, even now. Interesting that n2n was not formed as a faith-based group and yet the core that gelled and regularly convenes nine years down the pike is. Another instance, I believe, of a group God called together that would not have touched each other's lives otherwise. One of n2n's biggest lessons for me was recognizing white privilege. As a woman, I could identify with the times I felt discriminated against and as a pushed-down minority. However, I still had the Caucasian- birthright thing working in my favor. I wrote this years ago as the result of n2n and it still speaks my heart. no one white is there to listen. ever told us we are nothing. that are painful, express sorrow. things we can do together. • Exactly who are my neighbors? • Who have I discounted? • What lessons have I learned when engaging with someone different from myself? • How do I encourage those relationships? • What do I give/receive? I sped to the gym with all of my gear after getting both girls off to school (ok, well it's Tad who walks them to the bus and gets their breakfast), bent on being finished at 8 when the crowd takes over the lap lanes. In fact, previously one in that group jumped in on me and we collided. Seared in my memory, it's an image that haunts me. As I push open the glass doors and swipe my membership card, I lapse into an almost hypnotic trance, bent on a single goal: traveling into the pool as quickly as I can and clipping through my laps before I have to share a lane. They are narrow, creating treacherous passing and shoulder pain as I squeeze when I meet another. It also prevents me from sinking into any rhythm as I am constantly on the lookout, getting my head out of alignment, craning to detect the other (very difficult in foggy goggles with my extreme nearsightedness sans glasses), making sure we don't bump. It's not relaxing, energizing or very productive. However, I have been grateful on occasion to share when no lanes are available; it's barely better than not swimming ... at least I am moving. I was in that zone today, cruising to my usual locker, efficiently stripping down to my suit, grabbing my one "wet" bag and robotically marking off the usual pattern of paces across the slate floor to the pool door. And bang, it hit me. I had forgotten my towel. I had duplicates of hairdryers, shampoo, cream rinse and everything else, but no towel. That's even worse than no underwear. I was so unnerved, I must've said it out loud and a dear voice from the other room responded: "Well, I have two, please take one of mine." I learned it belonged to Linda. I had recognized her face, but never knew her name. I pegged her as one of the aquatic exercisers, not a swimmer and, in my zone of eagerness, tried very hard to eclipse her entry into the pool to ensure I had a private lane. She had been on the periphery of my vision as I stuffed my locker and sprinted to the water. Apparently she had noticed me. Not only that, she came to my rescue. She nudged me out of my Stepford-wifelike stupor and into the present moment. Fortunately, I noticed the nudge and soon realized the grace of the situation. I really think my state of being able to see this began yesterday in worship when I sat down in what I'd like to call the power pew: when I selected a row alongside some of the most spiritually deep and aware women I know. I had the sense that this was something special. Another moment of grace. And it's a collection that I had not thought to put together or been in any circumstance with before. We probably represented three decades in age and a variety of experience. I have had private and extraordinary encounters with each of these women, grown to love them and relish their wisdom and insight. I had not chosen my seat for the company it offered, but rather out of haste as I had arrived on the late side, sought a bit different view than last week and planned to park myself quickly. After I took my place, I noticed the two women to my left. Later, another sat to my right and another, farther to my left and across the aisle, spoke, signaling her presence. In that worship, each one of us was led at different times to speak. The intensity of our positioning, proximity and the fact we were gathered* was palpable. And it must still be with me because I normally would have skipped to the pool in my usual focused fog. • What awakens me from unawareness? • How long am I able to hold onto that? • Is there a spiritual practice that helps increase my awareness? • Who are those with whom I connect more deeply? • What recently has been a gift of grace? Yesterday, a lady at the Red Box (where you rent movies for $1 a day) said I reminded her of Bridget Jones. We were conversing about our favorite movies. Apparently, we have the same taste in cinema. I was ahead of her and plucked The Last Station about the twilight of Leo Tolstoy's life out of the machine. She said I'd like that as well. I was so pleased with her Bridget Jones comment because I LOVE Bridget and how she always puts all of herself out there no matter what. I floated home at the thought someone else saw that in me. The Tolstoy movie was good, but very troubling to me. It cast his wife, the countess, as evil and encroaching on her husband's end-of-life work, which, he admitted, was spreading more love (and passive resistance) in the world. He really wanted to live a solitary, ascetic life, dismissing his longtime commitment to wife and children ... torn between obligation and abandonment. By then, he was the most celebrated living writer and had quite a following of like-minded admirers -- some of whom treated him as Christ. Even the countess saw through that. He was wooed by other Tolstoyans (any ego-fanning in that?) to give up all of his material possessions, which he did. It devastated his wife. It pushed her farther over the edge when he left in the middle of the night to live alone and die alone; in peace, as he said. Her reaction upon hearing the news the next morning was to throw herself in the pond. He remained separated from her until news of illness reached the countess and she took the train to wait outside his sick room. Tolstoy's chief follower and daughter would not let her enter until it was almost too late. She ran in ranting about seeking his forgiveness, which he gave in an embrace, then expired. If he preached love, how could he cut off his spouse and most of his children? And why was the countess seen as the madwoman? She was merely attempting to find her place in his new life. One claimed without her approval. Bridget is also shown through the lens of the madwoman ... a single woman living out loud and savoring life ... mistakes and all. Perhaps that's what appeals to me about these two sharply contrasting figures. Separated by time, age, culture, circumstance and even reality, they were unafraid to show emotion, express what they were feeling and be who they were ... way outside the norm. Mostly, they were searching for love and acknowledgement. Love of self. Love of another. Being who they are. Being. • What "mad woman (or man)" characters or people speak to me? • What part of me also rages? • For what am I raging? • How can acknowledging that madness free me? After what seemed like a very short night full of anxiety, I roused myself at 5:30, went to the gym pool between getting girls off to school (with much thanks to my other half or it would not be possible) and came home physically re-charged. but somewhat lacking mentally. I showered off the chlorine, fed my growling tummy and decided to head to my studio FIRST instead of the computer, from which I never seem to emerge. Maybe that's why I rarely get to my studio. Anyway, in my safe haven, I journaled and prayed and made art and pushed the negative out ... and into the paper and prayer. En route back to the house, the garden called; specifically, the eggplant, green beans and pepperoncini. They were begging to be harvested or languish. I obliged, having to go in twice for bigger colanders. I tenderly twisted the deep-plum colored eggplants off the vine, then headed to the strung-up beans on so many tangled yellow vines. I gathered for over an hour. Each time I finished an area and dumped a load, I looked back to see more. They beans appeared to grow magically as soon as one disappeared. The meditative task worked its spell on me and I laughed at the metaphor before me: "There IS plenty." That is what I was struggling to figure out in the studio, my concern for not having paying work at this moment and lots of expenses. It's so very hard to be outside of the American norm: to be called to ministry that is not yet a livelihood. It seems everyone else has returned to a rhythm and something productive such as school or a regular job. While I wait, which it seems I am often called to do. • With what am I wrestling right now? • Is there a way to release it? • Is prayer a possibility? • If so, what is my prayer? • When said, what's the response? Sitting in worship yesterday after a very profound communal reading (not a Quaker practice and fraught with personal memories of rote meaning), the blessed, gathered silence opened deep wisdom including that I am afraid. Constantly afraid. I know my body reacts as if continual fire alarms ring all of my waking hours. My nerves are on overdrive, a very unscientific explanation of fibromyaglia. I'm not certain a scientific one exists as it is not well understood. For years, doctors told me nothing real was wrong because their diagnostics could not detect soft-tissue pain. And yet, I don't believe I am the only one to feel afraid. I believe we all do at some time or another. So why am I afraid of the things I have already conquered? Because I want to pretend that I am in control. Life throws curve balls and, so far, mine have been manageable. What, specifically, has made them manageable? Something bigger than myself. Use whatever word or concept you desire. That something is also bigger than our cyclone-like culture that smashes anything in its path that refuses to move in the same direction; our addiction to 24/7 news that only looks at the negative, preying on disaster; reality TV that caricatures our humanity, passing it off as exemplary or stingingly revealing weakness; the constant noise and distraction in our lives; a prevalent competitive spirit that compares and judges; and whatever else erodes our natural balance and rhythm. My best defense again fear is prayer: talking to God/Spirit/The Universe as often and as deeply as I can. • What rules me? Fear? Gratitude? • Of what am I fearful? • How can I counter that? • What fills me with negativity? Fills me more lovingly? • How can I nurture myself while being a part of the world? Mostly, I wonder what the Universe holds for me, seeking clarity. Rarely, I know as I have the past two days. zations: 4; surgeries: 1) summer. One day I ventured to a nearby labyrinth lingering in the center for a long meditation and journal reflection. Well overdue. Another, I spent in my studio (which I neglected ALL summer) on seven paintings and writing about them, which was, really, poking around in myself, checking my pulse. It stirred up important, though not easy, emotions, lessons and wisdom. Included in this sacred space was much prayer – intercessory for others and myself; particularly for clearness about my path. Everyone has returned to a rhythm this week, either to school or work or something. Not I. I am engaged in emptying all the busyness of the past months, trying to unearth myself, the Divine within and what the Divine within is currently asking of me. Prior to summer, I had been on a giant rolling wave, finishing a series of two books and the ominous proposal to accompany them. My sandwiched (kids and parents) summer brought that work to a screeching and anticipated halt. Yesterday, I was invited via Facebook to a writing colloquium at the Earlham School of Religion by a wonderful Quaker author I know, Brent Bill, on writing as ministry. Brent is speaking as well as Quaker songwriter/performer Carrie Newcomer. There's also the chance to submit book proposals and meet with a real, live editor. YES, my heart fluttered. I e-mailed my Quaker minister, who said she thought "way was opening*" for me. Today as I was walking to my yoga class, I had to navigate the busiest street in town. At peak-morning rush, when I came to the curb, there was nary a vehicle in sight. Way literally opened right there and the metaphor was not lost. 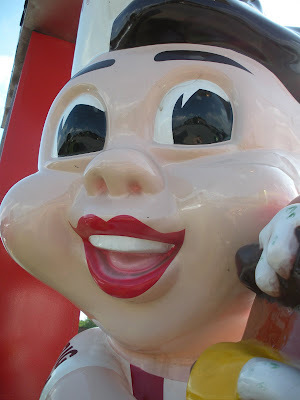 I crossed right by the Frisch's Big Boy and thought, for an instant, he winked at me. Later, I met a stranger at another dangerous intersection ... a woman "from the country named Edna," who was so grateful to meet a friend with whom to traverse the harrowing path. Not sure what that means, exactly, but it felt like a message. As I pondered that, I looked down to see the words "one way" and a yellow arrow under my feet. I am walking the right way! • Do I make sure to use intercessory prayer for myself and not just others? • How has that prayer been answered? • Recall a time when the answer was very clear? • Or, perhaps, is it always clear and I'm not listening? • What helps me to listen to the Divine better? I am beginning to hate junior high. And I didn't realize what a touchstone it is for me. All summer, I regaled my oldest with stories about the possibilities of new friendships with untapped groups of students just when it seemed you'd outgrown some of your old ones and elementary school. All summer, we shopped for school supplies on sale, making it a kind of hunt. All summer, we slid into a relaxed schedule with some shape. All summer, we looked forward to this new experience. I think my daughter is taking it much better than I. It is making me realize when some of my personal issues evolved: IN JUNIOR HIGH. At the time, it just seemed like the flow of life and progression toward adulthood. Now, I see it as something very different and so extremely counter to what my intuition tells me. So far, it's all about rules, pleasing this teacher and that. Rules probably aimed at troublemakers, but sucking the life out of everyone else. Since when should using the bathroom be a privilege? Of course it must be monitored, but when my kid comes home saying she had to wait hours, it bothers me. Reminds me when, in seventh grade, I was late to class by two mere minutes. My time of the month and it was all new to me and too embarrassing to tell my male science teacher why I was really late. So, I said I was sick. I got my choice of a paddling or writing sentences. Pretty humiliating for a good student never before in any trouble. Now, I would loudly boom: "Oh, Mr. Ross, I was changing my tampon and it took a little time as it's kind of new to me." Wonder what the punishment would have garnered? His reddened face? Now I clearly see it as ego. Not mine. Maybe not even the teacher's. Maybe an institutional or cultural ego that snaps: "You will NOW do things as I say." A rude awakening from the nurturing arms of elementary school. That ego commands: buy MORE supplies in two days when stores are wiped out, well past back-to-school and into Christmas. Find a very, very specific calculator that none of the three office-supply or three big-box stores nearby carries. I could order a teacher's set of 10 for $200 or travel over 50 miles to another location. How difficult, really, would it have been to put that on the summer list? I have a lot more gripes, some stem from a rather rude introduction last year and treatment as a number and not a child. So I ache for my daughter and pray for the wisdom to guide her through this messy maze that could wound her. Why aren't we teaching kids this age to be more of who they are, not form them like little drones into what a system says they should be. Boxing them in so they forget they ever had a sense of themselves and begin to conform to other's expectations and demands. I now realize that's when it began for me. When I became part of the system. A system that just spits us out. As I grieve that for myself with recent awareness, I also pray the lessons help me be a better mother in guiding my daughter into being more of who she is regardless of what any institution tells her. Not elementary any more, is it? • Can I identify a time early in my life when my wounds were inflicted? • How can I safely explore them? • How can I use them as spiritual growth for me and, possibly, in guiding others? • When and where have I encountered institutional damage? We were a ragtag bunch Sunday. The leftovers who had no holiday plans. Yet, it was this group God specifically called together to worship. And I almost didn't make it, tending to stray dogs uncautiously playing the the road. I do not understand what I do. For what I want to do I do not do, but what I hate I do. And if I do what I do not want to do, I agree that the law is good. As it is, it is no longer I myself who do it, but it is sin living in me. I know that nothing good lives in me, that is, in my sinful nature. For I have the desire to do what is good, but I cannot carry it out. For what I do is not the good I want to do; no, the evil I do not want to do—this I keep on doing. Now if I do what I do not want to do, it is no longer I who do it, but it is sin living in me that does it. Where is this going? I thought. Is he really, truly going to apply it to himself? That's such a hard one. He did, but with such grace and the ability to compassionately suggest he was not alone. He started the conversation. God speaking through so many on this particular Sunday. More vocal ministry than is usual, yet so very rich. Some stood up who have never publicly spoken. One sang a cappella from memory. Others shared deeply, reflecting on the prepared message. What it really opened for me was a conversation about places other than the light, where Quakers so often speak of living. At times, I have wanted to shout: "What about the shadows ... don't they have a place in us as well?" I didn't have to yell Sunday; it came out naturally and lovingly. The entire conversation danced that way. I've not before experienced a time in worship when there was this sort of elevated conversation. As if God were speaking so flowingly through her ministers. There were palpable movements of hearts. Hearts ready to share, willing to open and spill. Another portion of the message had been about how a whole heart is a broken heart. I have learned that lesson through experience ... a long time in coming, but so very deeply ingrained in me. It is through surrender in those vulnerable and broken places that we are closest to God because there and then we give up ourselves, our ego, our insistence on independence. This is when we find oneness. And Sunday, I believe we found it together. • How have I explored the shadowy parts of myself? • Can I claim them, thus exposing them to the light? • What has my experience of God been when I am vulnerable and broken? • How have I ministered or been ministered to through that brokenness? • What's an experience of God speaking to me in worship? I am beginning to swing back into a post-summer rhythm even though the kids technically don't climb aboard the bus 'til next week. We're making them get up as if it were school, so it's not so tough when it is. It also means I have returned to the gym for laps and 5:45 a.m. class. During one of those swims I had an epiphany as I often have ... though not during summer swims at the crowded and noisy, but gloriously outdoor pool. I realized, in a wordless way, that I really am fine the way I am, in the body that I have and with what life has offered me. I had known I was supposed to feel that way, but it finally sank deep into my tissues, as I need it to, to truly grasp any concept entirely. OMG, I really truly have been fighting myself for so long thinking in my twisted mind that I should have done this, been that or had that. When, in reality, my being and experience are just as they should be. When, exactly did all of that negativity and judgment of myself begin? Who knows, but our culture has certainly ingrained it more fully in me. A more relevant question is: Can I release that unhealthy thought pattern NOW? What would that look like, feel like and change? It really is rooted in the fact I am NOT in control except in how I respond to life and circumstance. My wise pastoral counselor says responsibility is the ability to respond. I think that may mean I have a choice as to whether or not to respond. My auto mode is always to respond, even if I have not one iota of energy left. And that, in a nutshell, is why I feel such energy loss. Just because I can, doesn't mean I have to. Somewhere along the line I fell into the nasty practice of believing I had to give all of my gifts away whenever there was a need, even if it meant completely emptying myself [granted, sometimes emptying is filling and restorative]. That really does feed my ego and perceived identity as the helper (enneagram type 2). I lost track of feeding myself. I was the one who could always be counted on to help, figure it out, be creative, etc. Last night a strange little movie with an innocuous title, Post Grad, reminded me that life is not about where we aim to go, but who we're with ... and as I ponder that I also would add how we're with life. A line from another movie, one of my all-time favorites, Bridget Jones's Diary, has become my informal mantra: "I like you just the way you are." That's all crazy Bridget wants to hear. That's all any of us wants to be told. Mostly, we need to tell that to ourselves. My next favorite Bridget Jones line, from the book and not in the movie, is: "But what am I going to do with my life. I know. Will eat some cheese." • How can I turn off my inner critic? • How do I escape or counter the deadening and damaging cultural messages? • In what ways do I fight myself? • In what ways can I relax that pattern? • How can I feed myself?